Glowing high overhead is the gray dome of the Panthéon, that pompous monument to France’s military glory. My morning walk is taking me through the hilly Parisian neighborhood of le quartier de la montagne de Sainte-Geneviève, “Saint Genevieve’s Mountain.” It’s named after the city’s patroness, who saved Paris from destruction by the Huns in the fifth century. The Panthéon is built on the site of a church dedicated to Genevieve, and the plaza behind it still bears her name. I continue two blocks farther up the hill to visit the church that contains the relics of – who else? – Saint Genevieve. Saint-Étienne-du-Mont was built in 1492 to serve the workers employed by a nearby Benedictine abbey, and has undergone several transformations since then. In fact, this morning another restoration project blocks the main portals with sheets of bare plywood, so I have to find my way in through a side door. I step into a silent world that is awash in pale golden light. Gentle silver sunshine filters through the stained glass windows, making the gray walls glow with dappled blues and reds. The elegant vertical lines and the joyful airy lightness of the place bring a wide smile to my face. Stretching across the middle of the church is a delicate bridge of carved marble with a graceful spiral staircase at either end. I reach for my little guidebook and find that this is a jube, or rood screen, dating from the Renaissance; it’s the only one left in Paris. I stand still and just watch its polished stone glisten in the quiet light. The next paragraph in the book notes that the round pillars are another inheritance from the Renaissance, while the pointed arches and stonework are pure Gothic. In the space of just a few minutes, Saint-Étienne has become one of my favorite churches in Paris. I wander into the side chapel that contains the remains of Saint Genevieve. Inside this shadowy little space I have to tilt the guidebook page toward the meager light and squint: during the Revolution a mob broke into the church and emptied the saint’s coffin into the Seine. Part of the casket and some of the relics were recovered, however, and were returned to her chapel, where they now lie undisturbed in a rich reliquary. I picture the angry mob storming into the church and laying violent hands on the precious relics of their patron saint. I turn around to face a small altar. Its tabernacle is flanked by a pair of wooden statues, each about four feet high. 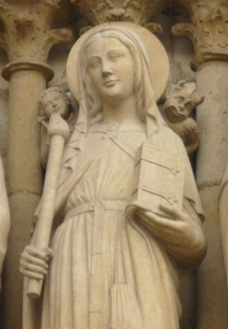 My book says the one on the right, holding a white candle, is Saint Genevieve herself. In the dim shadows it takes a couple of moments before I notice that she is not alone. Perched on her left shoulder like some evil bird is a small, dark-brown demon. His brow knit in fierce concentration, and his cheeks puffed with foul breath, he is trying to blow out the flame of the white candle the saint is holding. The dark figure is comical, but also a little unnerving. Then I notice, on her other shoulder, a little white-robed angel calmly waiting, with a lighted taper in his hand. The plot if obvious: every time the evil spirit blows out Genevieve’s candle, the good angel simply reaches over and lights it again. I sit down on a wicker-seated chair facing the altar to rest and pray for a few moments. I start to meditate on this painted wooden statue and the little drama that has been unfolding on her shoulders for hundreds of years. Its charming, simple theology seems naïve at first, but I’ve learned not to laugh too fast at the spiritual imagery of our ancestors in the faith. The stories the desert mothers and fathers told about demons are often quite insightful and subtle. In their view the demonic stood not only for the evil forces that attack us from outside, but also for everything that is disordered and incomplete inside of us. “The demon of greed,” they would say, “came to a brother one day.” Or, “The demon of pride approached a brother in his cell.” Maybe this statue was the local Benedictines’ homage to the wisdom of their ancient forbears of the Egyptian desert. As I look at the nasty little demon with the puffed cheeks, I remember what our senior monk, Father Celestine, used to say all the time: “The devil is always stirring things up!” The master of dissension and discord likes to sneak in and disrupt any good thing he sees happening. He may try to blow out your candle by overwhelming you with distractions when you’re trying to pray, or by showering you with feelings of frustration and resentment when you’re trying to be kind to some difficult person. Ancient monastic tradition taught that another favorite weapon of the evil one is discouragement. He just keeps coming and coming after you, trying to wear you down. 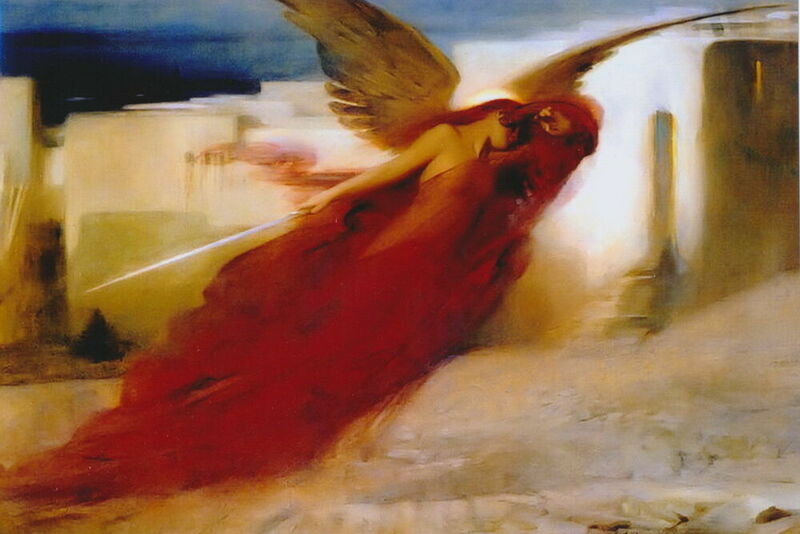 He blows out the feeble flame of hope in your heart, but God’s angel relights it. The devil blows it out again, and the angel lights it once more. The demon keeps repeating the pattern over and over, hoping that one day you’ll grow weary of the battle and throw up your hands in despair. This statue sends a beautiful message to people who feel discouraged: although life may indeed be a struggle at times, there’s no reason to lose heart. When the flame of patience gets blown out in some frustrating situation, or when the last flicker of brotherly love dies because of something someone does to me, I can remember this statue of Saint Genevieve: God’s angel is always there to relight my candle. No matter how many times my own shortcomings and vices may extinguish the flame, the Lord always lets me start over. I may get tired of the battle, but God’s angel with the lighted taper never does. Let the devil whisper words of discouragement, and try to make me grow weary of constantly repeating the same old mistakes and sins. Let him tell me that God is tired of my obvious inability to keep my candle burning. The patient angel with the taper will always be there to rekindle the flame one more time. I stand up to continue my tour of Saint-Étienne-du-Mont. First, though, I step over to the bank of votive lights flickering serenely in the shadows near Genevieve’s statue. After dropping ten francs into the slot, I reach out with a little taper and light a big white candle. Think of some prolonged struggle you are going through, or which you may have gone through in the past, one which got pretty discouraging. How did the Lord keep rekindling the flame in you? Was it some particular person, some thought, some event? Prayer, lectio, and acts of charity can be effective ways of overcoming discouragement. Ask the Lord to keep renewing your sense of hope and perseverance not just on the Lenten journey, but all along life’s pilgrim road. And finally, never lose hope in God’s mercy.